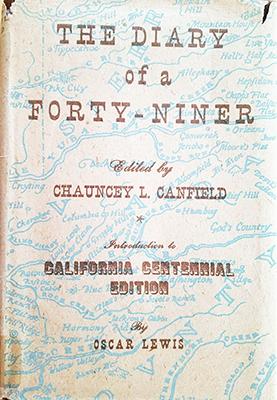 In the 1947 centennial edition of The Diary of a Forty-Niner published by James Ladd Delkin, Oscar Lewis, a California historian, researched the origins of the book. Below is his introduction along with his findings. In the voluminous literature of the Gold Rush The Diary of a Forty-Niner has long occupied a position at once unique and puzzling. Almost every phase of the book’s history—it’s origin, its source materials, its writing and publication—bristles with unanswered questions. its authenticity has aroused a great deal of controversy, much of it heated. Students and collectors of Californiana have taken widely divergent views of its value. Some have pronounced it a hoax and dismissed it as a work of light romantic fiction, wholly without historical importance; others have stated just as positively that it presents as true and graphic a picture of day-by-day life in the California placer camps as can be found anywhere. It [The Diary of a Forty-Niner] presents as true and graphic a picture of day-by-day life in the California placer camps as can be found anywhere. The reasons why this unpretentious, spirited, and uncommonly readable little tale of Gold Rush experiences has aroused so much discussion, such sharply divided opinion, become clear enough once one begins delving into the complex story of how it came to be written and published. The book was first issued a little more than forty years ago but it had its beginnings of a good many years earlier. The author, Chauncey Leon Canfield, was born in Litchfield, County, Connecticut, in 1845; when he was seven he was brought to California by his father and lived some time in Mariposa County where he gained first-hand knowledge of life in the Mother Lode diggings. Later he drifted into newspaper work, and from 1876 to 1879 he edited and published the Weekly Leader in the then-booming silver mining town of Eureka, in central Nevada. From there he went to Chicago, where he continued his career in journalism, working first for the Record-Herald and the, from 1884 – 1887, for the Chicago Times. It was while he was serving as “railroad editor” of the latter journal that the management of the Chicago, Milwaukee & St. Paul Railroad sent him back to San Francisco as general agent for that important transportation system. This position Canfield continued to hold until his death in 1909. Around the turn of the century, the Chicago, Milwaukee & St. Paul’s San Francisco headquarters were on the ground floor of the old Palace Hotel. The office had two entrances, one on Market Street, the other opening on an inner corridor of the hotel, and, because the business of the railroad did not require so much space, Canfield sublet the rear room. His tenant was a colorful early California figure named Lewis Hanchett. Hanchett, born near Joliet, Illinois, had come west during the Gold Rush, had worked at various placer claims in the Grass Valley-Nevada City area, then had gone into quartz mining, supervising large-scale operations in Nevada, Colorado and elsewhere. It was from this inner office in the Palace Hotel building that Hanchett, then an old man, looked after his varied interests. The Diary of a Forty-Niner owes its existence to this fortuitous meeting of the practical mining man, Hanchett, and the former newspaperman, Canfield. Occupying connecting offices, the two were in daily contact; Hanchett’s fund of stories of the life in the Northern Mines captivated the younger man, who encouraged his reminiscences and made copious notes, sometimes calling in his assistant, Carl Kniess, to take down the old man’s words in short-hand. It was from this mass of material that Canfield, who had long made an avocation of writing—he had published a volume of short stories in 1888—compiled the narrative here reprinted, casting it in the form of a diary and availing himself of the fiction-writer’s privilege of weaving into his factual story the pretty romance that—in part at least—must account for the book’s long-continued popularity. But it is abundantly clear that when he penned the Diary the author had a more serious purpose than merely to write an entertaining piece of light fiction evidence exists that while the manuscript was in preparation he visited the area described in the Diary and spent some time in the Nevada County newspaper office of Leonard S. Calkins, carefully examining the early files and checking the accuracy of his story’s background. So much for the writing of the Diary; it was based mainly on the recollections of Lewis Hanchett, supported by Canfield’s own independent researches, plus his imaginative embroidery designed to give the book a romantic quality it would otherwise have lacked. The record of how the manuscript found its way into print is hardly less involved than that of its writing. When it was finished, the author turned the work over to A.M. Robertson, who then conducted and active publishing business connection with his retail bookstore on Stockton St. During the spring of 1096 the Diary was set in type and printed; then, while it was being bound, occurred the earthquake and fire of April 18thand Canfield’s volume, along with most of the city, went up in smoke. It has been stated that a single copy escaped destruction, but the subsequent history and present whereabouts of that problematical unique copy is not of record. Undeterred by this set-back, Canfield looked about for some other means of getting the Diary published. All the local print shops having been burned out, his quest took him further afield. There had recently been established in the East a publishing house that was, in a sense, an outgrowth of an enterprise founded a few years earlier in San Francisco. This was the Morgan Shepard Company, then located at 225 Fourth Avenue, New York. Shepard, a former bank clerk had, in 1898, formed a partnership with Paul Elder, who had served his apprenticeship in the well-known San Francisco bookshop of William Doxey. The two opened their retail book business at 238 Post Street and presently began publishing a group of small books so attractively designed and made that the firm soon gained a considerable renown: within a year or two their productions were being sold from coast to coast. Elder & Shepard continued to operate for seven years; then Shepard, whose major interest had always been in the publishing phase of the business, withdrew and moved to New York where he launched his own publishing venture. It was to this newly-formed firm that Canfield, soon after the 1906 fire, sent The Diary of a Forty-Niner. The book, designed by Shepard and bearing his imprint as publisher, saw the light on October 30, 1906. It was well received by readers and critics alike (although the latter were in doubt as to whether to classify it as fact or fiction), and it passed rapidly through several printings. Then the bad luck that had dogged the venture from the beginning stuck again; in April 1908 Canfield wrote a correspondent that a fire in a New York printing plant had destroyed the entire stock of the fourth printing. The book thereupon went out of print and remained so for twelve years. It was then reissued by Houghton Mifflin Company, Boston, in a new format but with the text unchanged. This 1920 edition, however, met with indifferent success, and a year or two later most of the unsold copies were bought by Harold Holmes, who sold them at bargain prices in his San Francisco and Oakland stores. Then occurred a singular phenomenon familiar to all collectors: like numerous other worthwhile works of Californiana, the book, once common, speedily disappeared from view; for nearly twenty years it has been rated a scarce item, with copies of the first (Shepard) printing bringing in $20 or more and the Houghton Mifflin edition somewhat less. The present reissue of the book is long overdue. The subsequent career of Morgan Shepard is interesting. Sometime after 1906 he adopted the nom de plume of John Martin and for many years he was widely known under that name as a writer of children’s books and as editor of the John Martin’s Book, a highly popular juvenile magazine. He died May 6, 1947, at the age of eighty-two. it gives so lively, varied, and well-rounded a picture of the time and place as to make it not only extremely easy reading but enormously informative. For all the author’s tendency to view his subject through rose-tinted glasses, the book is sound in its fundamentals, and any present-day reader curious to know the feel and flavor of life in the Sierra diggings a century ago can hardly gain this information more pleasantly than on the pages that follow. Note: For much of the information in this Introduction I am indebted to Messrs. John Howell and Lewis E. Hanchett, San Francisco, and to the staff of the California Room of the State Library, Sacramento, to all of whom grateful acknowledgment is made. 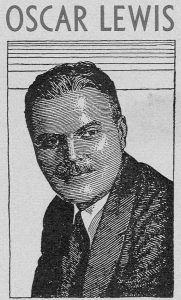 Magazine writer and California historian Oscar Lewis became well known in the late 1920’s and 1930’s for titles such as; The Big Four, Bonanza Inn, Silver Kings and Fabulous San Simeon. “We had a marriage up at Scott’s ranch last week and Marie and I went to it by invitation. Lou Hanchett, the boss miner on the ridge, has been courting a pretty girl at Selby Flat. They were friends of the Scotts, and the wedding was held at their place. About twenty of the boys from Selby Flat were there, as well as all of the miners from Rock Creek. Lou provided a big blow-out and ended up with a dance, which we kept up until midnight and then scattered. Hanchett is one of the best fellows in the country, but the boys are not exactly pleased with his capturing the belle of the county and taking her away from the Flat. If you liked this post, you might also like, Miner’s Shopping List.